Both teams ended their season recently. The men finished with a 4-9 record, while the women (10-3) finished third in the conference tournament. Both the men’s and women’s teams wrapped up in early October. While the women’s 10-3 record was stronger than the men’s 4-9 record, players on both teams said their squads experienced a considerable amount of growth. “Sometimes a winning streak can cause a team to get tight and stressed, but this team seemed to enjoy the pressure and actually played better,” Coach Roger Ferguson said of the girls. Pushing through the pressure paid off, as the ladies finished in third place in the Crossroads League tournament. Team captain Morgan Bemisderfer said the success of her team could be credited to the girls’ closeness and ability to push each other. “We have a depth this year that we really haven’t had before,” Bemisderfer said. Bemisderfer, who will be a senior next season along with Kerrie Eckert and Celine Rongos, said the girls are going to continue to put in the time and effort in the off-season to have an even more prolific season in 2016. The men struggled to find their control on the court. 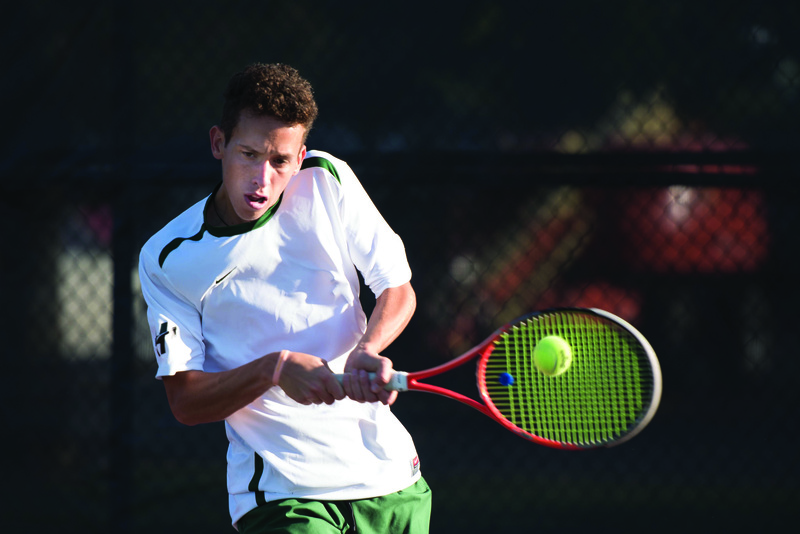 “Our team is young, and in tennis, that matters a lot,” freshman Giovanni Martinez said. Nearly half of the players on the 2015 roster were freshmen, and the lack of collegiate experience kept them from defeating more seasoned teams. Although they finished sixth in the Crossroads League, Martinez said the season prepared them for future success. “For the next two years, we are going to be really good,” Martinez said. Ignacio Ponio, another freshman, said his coach encouraged the team after the season ended, and is already setting his sights on a goal for next season. “Coach told us next year a goal for us is going to Nationals, because the potential we have [is immense],” he said. Each team produced two players who received Crossroads League all-Conference honors. Constanze Golz, a sophomore, and Bemisderfer represented the women. Number-one singles player and senior Joseph Straznicky and Poncio also received the recognition.